Strawberries are one of the first fruits of the season and have long been associated with rebirth and Spring. In ancient times they were used not only for food but also for medicinal purposes. Tamra Andrews in 'Nectar and Ambrosia' tells how ancient hunters in Central Europe would eat strawberries "to sharpen their powers of perception. Others used them to cure nervous disorders, control heart palpitations, and purify the blood." Although we no longer use strawberries as a cure for our ailments, they are nonetheless rich in Vitamin B and C and contain potassium, iron and fiber. Strawberries are an aromatic, glistening-red, roughly conically shaped berry covered with what looks like tiny black dots. These dots are called achenes and are the true fruits of the strawberry plant. Each achene is really an individual fruit containing a single seed. This is why the strawberry is a 'false' or 'accessory' fruit because it comes from the base of the flower rather than the ovary. Strawberries are divided into two categories: Cultivated and Wild. There are hundreds of varieties of cultivated strawberries. The modern hybrids were developed to make the strawberry more commercially viable i.e. improving size, appearance and shipping quality, extending the growing season, and overcoming diseases. There are spring bearing and ever bearing varieties so strawberries are now available year round. The best tasting cultivated berries, however, are in the spring and summer months. The small, sweet, deep-red wild strawberry (fraise des bois) is difficult to pick, fragile and has a low yield so they are not cultivated commercially. This makes them expensive, but try them if available as their flavor is far superior to the cultivated strawberries. Adding a small amount to a bowl of cultivated strawberries really improves the flavor of the cultivated berries. When choosing strawberries look for fragrant, plump, firm, uniformly sized, bright-red berries with no white or green "shoulders" at the stem end. The green leaf-like cap or hull should still be attached and not brown or wilted. There should be no soft spots, bruising or mildew. Always check the underside of the container to make sure there are no squashed berries or red juice (sign of overripe berries). Strawberries range in size and can be as small as a grape to as large as a golf ball. Size is not the deciding factor to taste but generally the larger berries are not as flavorful. Even though strawberries are usually picked before they are fully ripe they do not ripen further after picking. They only get softer. Strawberries are a delicate fruit and do not store well. If not using immediately store in a single layer on a paper towel-lined tray in the refrigerator up to 2-3 days. Do not wash or remove caps before storing as strawberries absorb moisture. Immediately before using quickly wash berries (do not soak), with caps still intact, so the berries will not fill with water which, dilutes the flavor of the strawberry. Remove the leaf-like caps with a sharp knife or strawberry huller. "Doubtless God could have made a better berry, but doubtless God never did." - Strawberries contain 85-90 percent water. - The name 'Strawberry' comes from the 'straying' habit of the strawberry plant. - Wild strawberries are very expensive, as they are difficult to pick, fragile, and have a low yield. - Wild strawberries have a superior flavor to cultivated strawberries. - Aroma, rather than color or size, is the best indication of flavor. 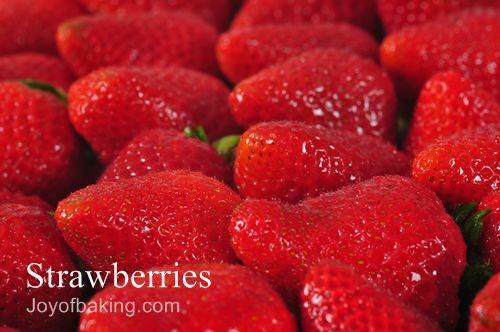 - To bring out the full flavor of strawberries, place hulled and sliced berries in a bowl and sprinkle with granulated white sugar (about 2 tablespoons (28 grams) per pint). Let the berries and sugar macerate at room temperature for at least 30 minutes. - The strawberry plant is a member of the Rose family and the strawberry is from the genus Fragaria, which is the symbol of the Virgin Mary and of Summer. Strawberry Huller - An inexpensive stainless steel 2 1/2 inch long (6 cm) tweezers with wide rounded concave ends that when placed on either side of the green leaf-like stem, removes the stem plus the white core. Better than a sharp knife as it does not cut into and remove any of the strawberry flesh.